Now that you have your braces, how do you take care of them? It's important for you to know how to properly take care of your braces and appliances throughout your entire orthodontic treatment. Don't worry, you'll be eating popcorn and snacking on potato chips again in no time! However, before you can start enjoying some of the treats you love, you will need to take special care to avoid any foods that could damage your new appliances and potentially slow down your treatment. 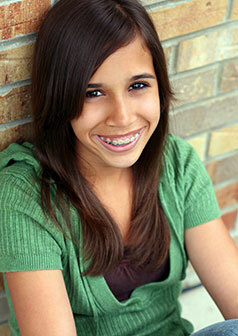 When you first get your braces, you may notice that your teeth and mouth feel a little tender or sore. This is perfectly normal and we can assure you that your mouth will not be sore forever! To relieve the discomfort, we recommend dissolving one teaspoon of salt in eight ounces of lukewarm water. Swish and gargle this solution in your mouth for just a couple of seconds (do not swallow the saltwater). It is also not uncommon for your lips, cheeks, and tongue to become irritated for one to two weeks while getting used to braces. When you first get your appliances, our knowledgeable staff spend time with you showing you how to take care of your braces. We would be happy to give you some extra wax if you need it. Regular salt-water rinses will also help alleviate the initial discomfort. If your teeth begin feeling a little loose, don't worry; this is normal! When your teeth first start moving, you may experience some discomfort and/or pressure. This is temporary and should not last more than a couple of days. The wires and bands on your braces may come loose. If this happens, please contact us as soon as possible so that we can take care of the emergency and repair your appliance as needed. If any piece of your appliance comes off, be sure to save it and bring it to the office with you. You can temporarily "fix" the loose wire by using the back of a spoon or the unused, clean eraser end of a pencil to carefully and gently push the wire back into place. If the loose wire is causing irritation to your lips or cheeks, put wax or a wet cotton ball over the broken wire to relieve the discomfort temporarily until we see you. Game, Set, Match — we have great news for athletes! You can still play sports even while undergoing orthodontic treatment! If you do play sports, it's recommended that you wear a mouthguard to protect your teeth and your appliances. Let your doctor know if you need help finding the right mouthguard for the best protection. In case of a sports emergency, be sure to immediately check your mouth and appliances for damage. If you notice any loose teeth or appliance damage, please contact our office immediately. You can temporarily relieve minor discomfort by applying wax or rinsing your mouth with warm saltwater.